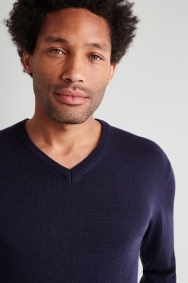 A staple V-neck for every occasion. 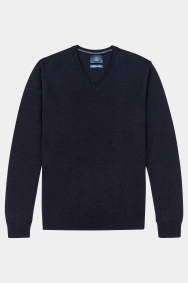 Strike a refined daytime or evening look with the help of this Italian-made jumper from Moss 1851. 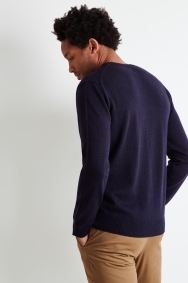 Its navy tone ensures free rein when it comes to shirt choices, while the premium merino wool construction is not only warm and soft, but also exceptionally breathable. 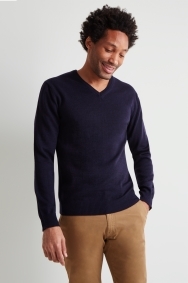 Use the jumper’s V-neck to frame a formal shirt if you’re heading to the office or pair it with a casual t-shirt and jeans for a warm and relaxed daytime look. Beautiful wool, nice fit. Good value.